Born in Vilnuis, Lithuania; grew up in Glen Ellyn, IL. Why did you come to Illinois Tech? I picked Illinois Tech because of the small class sizes, diversity, and quality of faculty. Illinois Tech has a great academic reputation and I feel challenged in all my classes. Why did you choose your major and specialization? Computers have been a hobby of mine since I was young; my dad is completely self-taught in IT and I loved watching him take them apart and go through the troubleshooting process. My interest in security came from curiosity about hacking and cyber-attacks; I loved finding loopholes in technology. This stemmed from gaming, as I would try to find ways to get the most out of my gaming consoles by unlocking them so I could have third-party apps. I figured it would be constructive to put that to use and protect people from malicious attacks. What is your favorite thing about being a student at Illinois Tech? I love the Illinois Tech community. Everyone here is so friendly and I think that stems from our diversity and team-oriented thinking. We’re all here to learn together and you can learn more from helping others. It’s a win-win: you teach someone a new concept and then you solidify that knowledge for yourself or even learn something new about that concept yourself. How has Illinois Tech helped you? Illinois Tech helped me branch out more. At my community college, I didn’t talk much with other students or the faculty – I kept to myself. 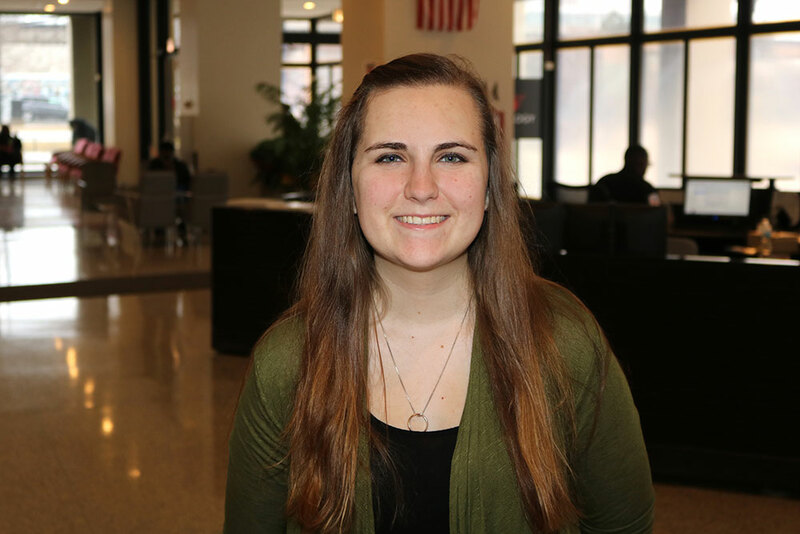 Illinois Tech has a very friendly atmosphere which allows me to feel more comfortable asking for help and making friends with other students within my program. What I love about Illinois Tech and the Information Technology and Management (ITM) program is that the professors have worked in the field so they have hands on experience on whatever course they’re teaching. They expand beyond the textbook and provide us real-life applications. For example, in my ITM 301 class, my professor would repeatedly explain that it’s better to send a laptop out for repair and not attempt to fix it ourselves. For one of our labs, he had us take an old laptop apart. After attempting to repair it, I saw with my own eyes how fragile a laptop is and how difficult it is to put it back together, which really proved to me what he was talking about. How is the academic experience? How does it compare to your previous educational experience? I love it here – all the professors are approachable and reasonable which allows me to feel comfortable in the classroom. I think one of the worst feelings for a student is to feel like they can’t ask a question or ask for help, which hinders our learning experience. I had a similar experience at my community college, except here, I feel like more students participate in discussions. At the same time, the classes that I’m taking now are geared towards my major and not general education classes like I was taking at my community college. People are more inclined to participate if they are engaged in classes related to the profession they plan to enter. How is campus life? What do you like to do? There’s always something to do on campus, but it’s hard for me to find time to participate because I’m a full-time student, I live on my own, and I also work to manage expenses. There’s so many clubs and welcoming people so it’s easy to find a place where you fit in. Thinking about the resources provided to you by your Department (labs, faculty, networking and career events, competitions), what do you find most valuable and why? The faculty are easy to get in touch with which helps whenever I need assistance with something, I don’t have to wait a long time for a response which is a huge plus. I’m blessed to have my own personal laptop, but there are open labs all over campus, which are accessible to students to accomplish their work. There is a career fair every semester, which is fantastic because the companies come to us to help us find jobs. Also, the representatives are extremely friendly; they realize that, as students, we sometimes get nervous to present our resumes and interview on the spot, so they provide us constructive criticism. Also, you can make an appointment to have someone review your resume and help you strengthen it for prospective employers. There’s no need to feel helpless because IIT has something to help you every step of the way. I have not used career placement yet. What were your concerns about coming to Illinois Tech? Commuting. At the time, I was still living in the suburbs so I didn’t want to commute almost every day to the city. I did end up moving downtown and getting a new job in the city, so that is no longer an issue. What type of projects or innovation have you done while at Illinois Tech? You can check out my github to see what I’ve worked on: https://github.com/kiskisiit1131. I also have my own personal website at akvilekiskis.com. Another project currently in the works (so I can’t give out too many details) is an app for a business competition I am working on with a few friends during my down time. How have you applied what you learned at Illinois Tech to your job? There’s been a few minor tech glitches with our POS system at my job not working and I’ve fixed it a couple times. There’s not much IT work I can do in a restaurant, but getting the POS to work is essential for me to complete my job. What is your proudest moment as a student? I recently found out that I was the only student from Illinois Tech selected for the scholarship to attend the Women in Cyber Security Conference in Tuscon, Arizona. I’m excited to learn from these amazing women and to represent my university. If I could do 1 thing over again it would be. There’s honestly nothing that comes to mind. Everything happens for a reason. Life doesn’t allow us the luxury of do overs, we just learn from our mistakes and move on. What is the biggest challenge you faced as a student? Time management. Being a full-time student, working, living on my own, and working on outside projects leaves me for little to no free time. I’m a bit of a workaholic and sometimes my health takes a hit as a result. I’m getting better at realizing when I need to take a break and not overwork myself. I’m not sure yet, I know I want it to be cyber security related. I’m hoping that when I attend the Women in Cyber Security Conference (https://www.csc.tntech.edu/wicys/) that I can receive more insight about the field. Learn Time Management, which is easier said than done. What helps me is to write everything down and prioritize what assignments are due first, which ones are easier to complete, and which ones require more time to get done. This helped me avoid putting assignments off until the last minute, especially big labs or projects. Our team was given the task of develop an electronic prototype covering the elements learned in the Embedded Systems course. These elements are electricity, data collection, data transmission, and data presentation. To do this, we created an electronic version of the board game Go. EcoTower takes Hydroponic farming to the next level by using technology to self-regulate plant growth. Hydroponics is the science of giving a plant the necessities for growth and longevity.